Three months after its release, Spiderweb has found a home in nearly every Weyland deck and will keep its slot in the foreseeable future. It has contributed to the age-old discussion of Subs > STR, knocking a taxing blow to popular barrier breaker Cerberus "Lady" H1 as well as the powerful Faust, giving the faction their slight edge in the Barrier market yet again. Pricing identically to Bastion for Corroder, Spiderweb has an additional benefit of not clogging up the 4 STR range of ICE, to which Weyland has few interesting options (Changeling, Wendigo). Weyland can now front a very versatile Barrier suite with Spiderweb at the core, flexing towards the cheaper rushy Ice Wall or Meru Mati, to the overall taxing Fire Wall or annoying Changeling, all while keeping Atman resilience and decent Faust tax. On the horizon of this review's writing, Spiderweb will also play a pivotal role is defending against Adam and his Always Be Running, taxing 4c to GS Sherman M3, and costing 3 cards to Apex: Invasive Predator. Spiderweb is somewhat weak to Grimoire + Parasite, and hilariously, Breach, as well as rampant face checkers, as 4c is not cheap. Consider including some ICE to burn reckless players. 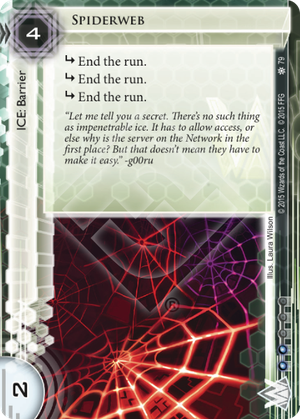 As a hard "End the Run" piece of ice with a rez cost of 4, the immediate point of comparison for Spiderweb is Bastion, and the core difference is the "strength vs. subs" debate. The first, most obvious point, is that to a runner using Corroder or Eater there is no difference whatsoever between these. Either you pay 2 for strength and 1 for the sub, or you pay 3 for the subs. So lets look at other icebreakers instead. When is Spiderweb better? Clearly, three subroutines is hugely taxing for any 2/sub icebreaker (Sage, Darwin, and Knight being the most popular). Faust will cost three cards instead of two. The incredibly common "Atman at 4" will not be able to touch Spiderweb at all. And a Spiderweb stops Quetzal cold when Bastion lets her through. All this, though, pales when compared to the effect on the ubiquitous "Lady"; instead of Lady breaking Bastion for 1 and one counter each time, instead it's going to cost the runner two tokens, meaning they can only get through Spiderweb twice before they need their recursion. Similarly, Spiderweb burns through Overmind at triple the rate Bastion does, albeit with a 2 cheaper break cost. There is a cost to being a Lady-killer, unfortunately. A significant cost, in the form of another immensely popular card. Parasite. At best, Spiderweb holds out two turns, and with Grimoire and Datasucker around it is extremely likely it wouldn't live even one. This is a huge deal for Blue Sun (which is arguably the most popular Weyland division). Even if Bastion only survives one turn, that's enough to pick it up and play it back down, saving the rez cost and trashing the virus in the process. Personally, I think this vulnerability makes Spiderweb difficult to justify, especially at a cost of 2 influence. I would only really consider splashing it into a Midway Station Grid deck. Otherwise, save your influence, and just play Bastion or Wall of Static.